What Does the Yield Curve Tell Us? If you have had the unfortunate pleasure of reading the financial press over the last few months you have invariably run into articles talking about the shape of the yield curve and the bad things it portends. A ten second internet search gives the following headline from the Wall Street Journal (see box to the right). If you peruse the darker underbelly of online financial news you can find much more inflammatory pieces that will soon have you burying your head (and your cash) in the back yard. But what is the yield curve? And why should you pay attention? The yield curve is a snapshot of yields, or expected rates of return, on a collection of bonds with different maturities. For example, the chart to the left illustrates a positively slopped curve whereby longer maturity bonds yield more than shorter maturity bonds. This is called a ‘normal curve’ because investors in 30-year bonds typically want to be compensated more than investors in 2-year bonds because they are tying up their money for long period of time. The interest rate risk, or duration, on longer maturity bonds is much greater. The steepness of this curve also tells us something. A steeply slopped curve can indicate that investors expect interest rates to increase over time due to a strengthening economy and rising inflation. A shallower curve would indicate more tepid growth and inflation expectations. At the opposite extreme is the so called ‘inverted yield curve.” This is a situation where long-term yields are below short-term yields, as you can see from the chart to the right. This is an unusual occurrence in the modern economy and is generally associated with central banks that are driving up short-term interest rates while investors start to worry about slowing growth or even recession, which drive down long-term interest rates. Looking back throughout history (at least since the Great Depression) we find the yield curve is typically positively slopped. This reflects the fact that the economy has typically grown and inflation has been positive. However, throughout much of the 19th and early 20th centuries the economy grew but we experienced persistent deflation, due in part to being on the gold standard. During this period the curve was inverted, reflecting the fact that deflation made current cash flows less valuable than future cash flows. But in modern history the yield curve is typically positively slopped. A negative curve is unusual, but also an important and possibly troubling economic signal. 1) The economy is growing and inflation is starting to perk up. 2) The Federal Reserve raises interest rates to prevent the economy from overheating. 3) As the Fed drives up short-term rates, longer-term rates remain static or even fall. 4) Long-term rates fall because investors start to price in a slower economy and/or moderating inflation in the quarters to come. 5) At some point the Fed raises short-term rates too much, causing a recession. Of course, we only know this in retrospect, but a warning signal is when the long end of the yield curve falls below the short-end. Does an inverted curve cause a recession or simply act as a signaling device? There is some thought that the inversion itself can actually play a role in creating a recession. If you think of a typical bank, their business model is relatively straight forward. They borrow in the short-term market (typically savings and checking accounts) and lend at longer-term interest rates (think 30-year mortgages, etc.). They make money on the spread between what they earn and what they pay. When the yield curve inverts this spread is compressed, leading to a loss of profitability and less lending. Tighter credit will naturally slow economic growth, especially for smaller firms that do not have access to the capital markets. As you can see below, since 1965 the yield curve has inverted prior to every recession (the curve is defined as the difference between the 10-year and 2-year Treasury). 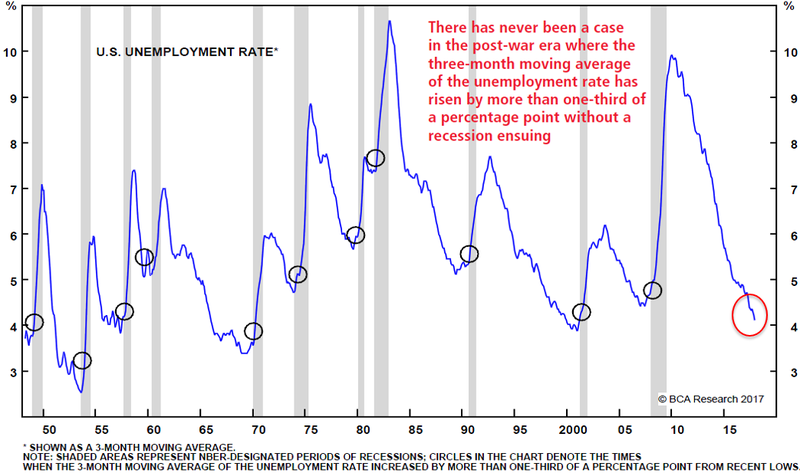 The circles show each time the spread went negative and the shaded bars show recessions. 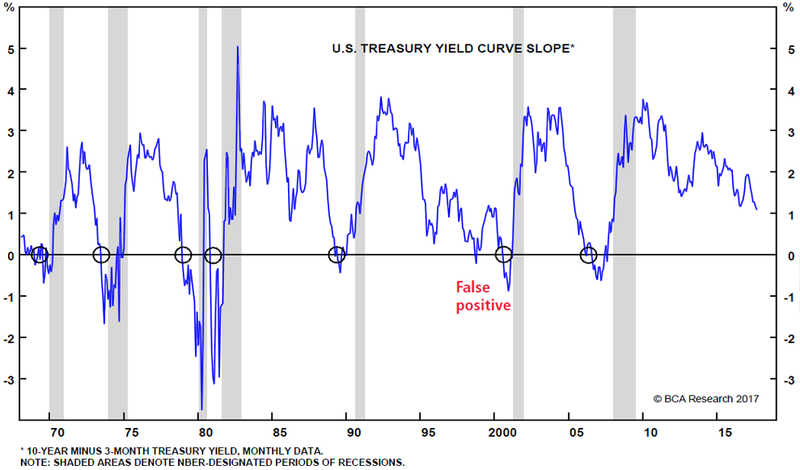 Over this period there has only been one false positive when the curve inverted but we didn’t get a recession. This was in 1997/1998 during the Asian financial crisis. The market was pricing in recession but prompt action on the part of the Greenspan Fed averted it. But in general, the yield curve has been a reliable early warning signal. As the headline at the start of this piece indicates, the yield curve has flattened significantly the last few months. As we write the difference between the yield on the 10-year and 2-year Treasury stands at just 0.42%, the narrowest spread since 2007, as you can see from the chart to the right. At the end of 2016 this spread was roughly 1.50%. This narrow spread is exciting some pundits and leading to articles talking about impending recession and bear market. We think such talk is way too early. Certainly, we could see a recession in the next couple years, but the path from here to there is long and a lot can happen over the next few quarters. If only it was as simple as going to cash the day the yield curve inverts. But of course, when it comes to markets nothing is straight forward. If you study the chart at the bottom of the last page it quickly becomes evident that the lag between yield curve inversion and the onset of recession varies greatly. If we look at the five most recent examples (table below), the lag between the first inversion and the start of recession runs between 10 months and 24 months with the average being almost 17 months. This means that if you made the bet of an impending recession in December 2005 you would have waited two years to be proven right. During this wait stocks can actually perform pretty well (see the table at the top of the next page). For example, between the time the curve inverted in December 2005 to the start of recession in December 2007, the S&P gained +22.2%. Looking at the last five examples, the average gain was +15.7%, and only in 2000 would investors have been rewarded for getting defensive as soon as the yield curve inverted. We should remember this came at the end of one of the greatest stock market bubbles in history, hardly an everyday occurrence. The bottom line is straight forward: while the yield curve is an effective tool to spot heightened recession risks, it is a terrible market timing tool. 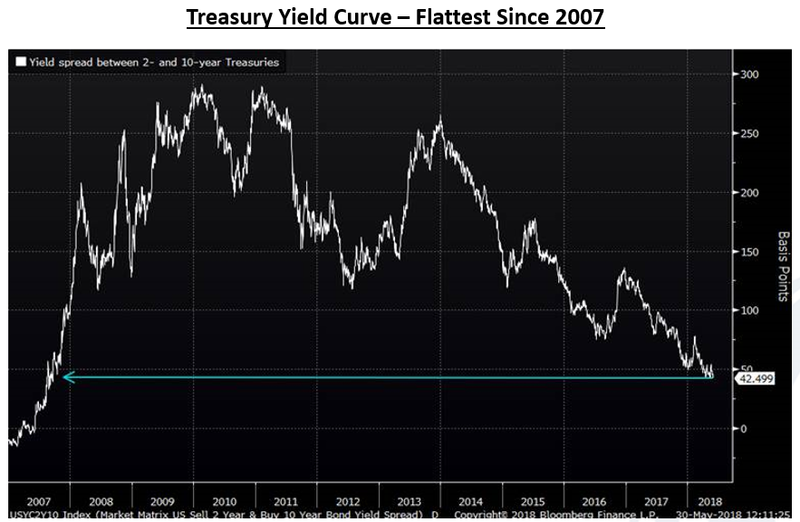 Should we pay attention to the yield curve? Without question. An inverted curve has consistently been a recessionary early warning signal and a key indicator of credit availability. When short-term funding costs are greater than asset yields (another way of saying the yield curve has inverted), credit becomes harder to access and recession risks go up. However, we shouldn’t overreact to a flattening curve, or even one that has recently inverted. The lags between inversion and recession/bear markets are varied and relatively long. We would delay any defensive portfolio moves until other signals begin to flash red. For example, rising yields on junk bonds or a rising unemployment rate (see chart above) would be additional signs that recessionary risks are rising. Neither one is even flashing yellow today. Bottom line: we do not believe that the recent flattening in the yield curve is sending an ominous signal. It will eventually, but we will are also closely watching other indicators for confirmation. 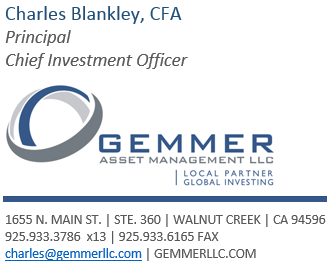 Published by Gemmer Asset Management LLC The material presented (including all charts, graphs and statistics) is based on current public information that we consider reliable, but we do not represent it is accurate or complete, and it should not be relied on as such. The material is not an offer to sell or the solicitation of an offer to buy any security in any jurisdiction where such an offer or solicitation would be illegal. It does not constitute a personal recommendation or take into account the particular investment objective, financial situations, or needs of individual clients. Clients should consider whether any advice or recommendation in this material is suitable for their particular circumstances and, if appropriate, see professional advice, including tax advice. The price and value of investments referred to in this material and the income from them may fluctuate. Past performance is not a guide to future performance, future returns are not guaranteed, and a loss of original capital may occur. Fluctuations in exchange rates could have adverse effects on the value or prices of, or income derive from, certain investments. No part of this material may be (i) copied, photocopied or duplicated in any form by any means or (ii) redistributed without the prior written consent of Gemmer Asset Management LLC (GAM). Any mutual fund performance presented in this material are used to illustrate opportunities within a diversified portfolio and do not represent the only mutual funds used in actual client portfolios. Any allocation models or statistics in this material are subject to change. GAM may change the funds utilized and/or the percentage weightings due to various circumstances. Please contact GAM, your advisor or financial representative for current inflation on allocation, account minimums and fees. Any major market indexes that are presented are unmanaged indexes or index-based mutual funds commonly used to measure the performance of the US and global stock/bond markets. These indexes have not necessarily been selected to represent an appropriate benchmark for the investment or model portfolio performance, but rather is disclosed to allow for comparison to that of well known, widely recognized indexes. The volatility of all indexes may be materially different from that of client portfolios. This material is presented for informational purposes. We maintain a list of all recommendations made in our allocation models for at least the previous 12 months. If you would like a complete listing of previous and current recommendations, please contact our office.